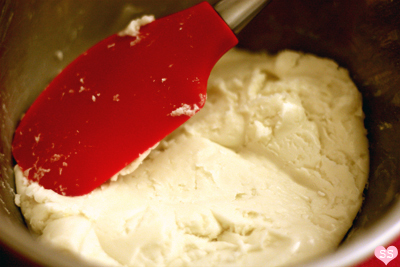 Place the tapioca flour in a bowl and microwave it for 1 minute (to get rid of any excess moisture). Let it cool. Pour it into a mixing bowl and mix in the powdered sugar. Then add the egg yolk, butter, and coconut milk. Mix until a dough forms (it has a plastic-y texture that reminds me of mozzarella cheese). Preheat the oven to 350ºF. Take 1/4 of the dough and place it between two sheets of plastic wrap. Roll the dough out very thinly, 2-3 mm in thickness. 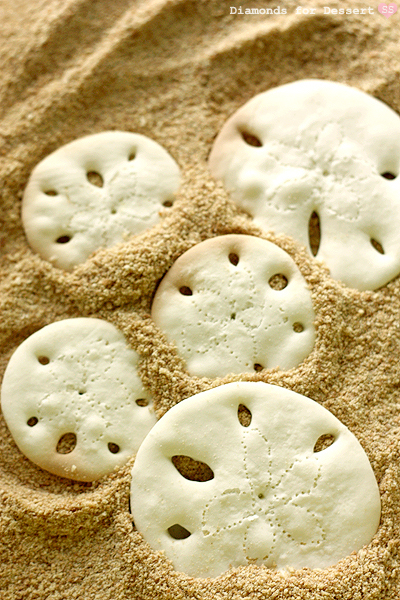 For large sand dollars, use a 2 5/8 inch diameter circle cookie cutter, and for small sand dollars, use a 1 7/8 inch diameter circle cookie cutter to cut out circles. Transfer them to a parchment lined baking sheet. Use a toothpick to poke a hole in the center of each circle cut out. Repeat with the rest of your dough. For the large sand dollar cookies, you'll need a pearl milk tea straw and a regular drinking straw (like the ones at fast food places). 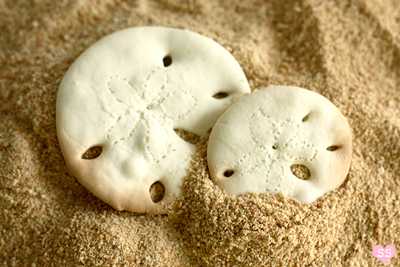 For the small sand dollar cookies, you'll need a regular drinking straw and a smaller straw (like a striped bendy straw). Take a pair of clean scissors and cut off a 1 cm piece from the ends of the straws that you are using. Pinch the straw pieces so that the ends become more elliptical than round. 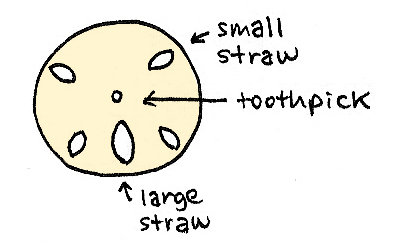 Then take the larger of the two straws and use it to cut out an oval hole in the bottom center of each circle cut out. Use the smaller straw to cut out 2 smaller ovals on both sides of the large hole. 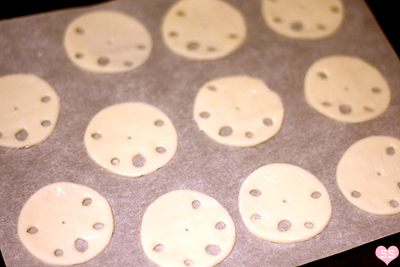 By the way, the holes will shrink while they bake, so it's better to make them a bit wider now. Place the cookies in the oven and for the larger cookies, bake them for 6 minutes, and for the smaller cookies, bake them for 5 minutes. At this point, remove the baking sheet from the oven. Use a toothpick to quickly prick out a dotted five-petaled flower shape on each cookie (be careful not to burn yourself on the baking sheet, if necessary, place an oven mitt on top of the baking sheet edge to have something your arm can rest on). If the middle hole has shrunk, take the toothpick and enlarge it. Place the cookies back in the oven and continue baking until the cookies are relatively crisp and begin to brown at the edges, about 5-7 minutes. Let cool on the baking sheet to finish crisping up, then move to a cooling rack. Those are really quite adorable! Fits perfectly with the summer theme. Paris too has been pretty glum these days, last night there was actual thunder and lightening! These totally have me longing for beach weather. 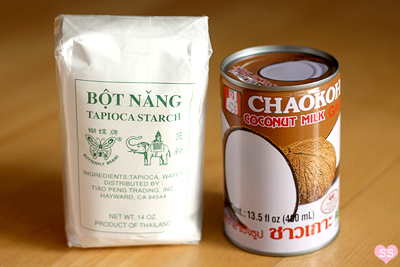 You have me intrigued by the tapioca starch, too. Have never used it in baking. But I love the idea of meringue-like cookies. This is an adorable post and cookie. I noticed it on TS and had to come over and tell you something sweet! Jessica: Thanks! Oh no, stay dry! Climate change :(. Emma: Interesting. Yup, Wikipedia is the best, full of so many random little fact and tidbits. Carolyn: The tapioca starch was definitely what caught my attention when I first saw the recipe since I'm so used to baking with flour. The starch is what gives the cookies their light and interesting texture. The Cilantropist: Summer parties sound lovely right now, perhaps later on in the summer once the weather clears. Diane: Thanks! Will do if I ever decide to take the Twitter plunge, still need to figure out how to better use my FB page. Sarah: Thank you for taking the time to comment :). Those look amazing and yeah for me, it's gluten-free! Epicurean Mom: Yay, definitely try it out :). Leanne: Thanks! Sand dollars are awesome. The cookie ingredients really got my attention because they're different from those in many cookie recipes. Kate: Thank you! I should probably work on getting some more gluten free recipes on this blog now that I think about it. These are fabulous and very beachy. The weather will change...some day soon, I hope. Love the tapioca flour. Anonymous: Oops, good catch! 2 1/2 cups. Thanks for bringing it to my attention, I was typing way too quickly. Janet: Haha, I hope so too. The cookies look yummy. I love mildly-sweet desserts, they usually have so much more depth to the flavor than the SUGARSUGARSUGAR! variety. tiff: Thanks, I just updated it this morning. It's cups. In this case, it takes the place of flour, so it'd make sense that there would be a lot more of it in comparison to the other ingredients. I definitely agree that when a dessert is too sweet, it distracts from all the other flavors present, which, sadly, makes what could have been a wonderfully complex recipe fall flat. I absolutely love these and am going to make these for an upcoming beach themed wedding shower! Thanks so much for sharing! What lovely and yummy looking cookies! I can't wait to make them. They look exactly like the real Sand Dollars that we've found right here at the beaches near Charleston, SC. I do hope I can find the Tapioca Flour! Thank you so much for posting! Love!!!! <3 I will definitely try these! joannb: Yay! Next time I visit an Asian supermarket, I will look for those cookies. Thanks for letting me know:). I'm quite curious to know what authentic kuih bangkit tastes like. janyclaire: That sounds lovely! I'm glad to share. fab: Thanks and no prob. I actually haven't seen a real sand dollar in a really long time (had to google image them), but I'm glad they look convincing, hehe. 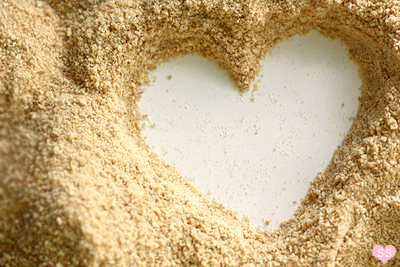 I hope you'll be able to find the tapioca flour as well. So Very Domestic: Yes, definitely try them out :D.
Love the sand dollar cookies! They're on my to-do list for summer. I also pinned this. 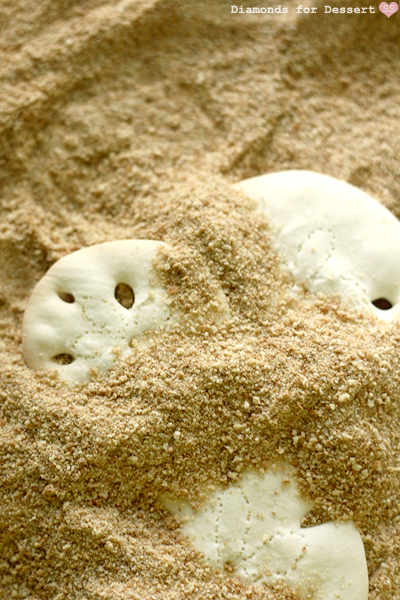 What is the "sand" you are displaying the cookies in? Zakka Life: Yay, do try them! Angela: Good question! Unfortunately I don't have the answer right at this moment (I forgot to count them). But, I plan on making them again within the next two weeks, so I'll let you know then. Betsy: The sand is graham cracker crumbs. I just ran half a pack of graham crackers through my blender. Thanks for the reply... but now I am frustrated. I am in the middle of making these cookies for my son's last day of school. Followed the recipe to a T, only doubled it. And before me I have a big batch of silky-coconuty liquid!!! I don't have a microwave to dry out the tapioca, so I put it in a low oven for a good while... not sure what to do with it?! Can you help? Angela: That's strange (usually when a recipe is doubled, it ends up being really dry). Just making sure, you only added 1/2 cup coconut milk right? And 2 1/2 cups tapioca flour? And you let the tapioca flour completely cool before using it? Because my dough ended up being dry (I even had to add a few more tablespoons coconut milk to compensate). It seems that they fry their flour for quite a while, 30-45 minutes and then let it cool. So hopefully you have more tapioca flour, so you can do it this way. So at this point, after the flour is cool, add your sugar, then your egg yolk and butter. Now instead of pouring all the coconut milk in at once, pour it in a little at a time and mixing so you end up with dough, not a liquid. Hopefully that helps! If you have more questions, shoot me an e-mail (unmacaronrose@gmail.com), I was going to e-mail you, but I couldn't find an address :(. Love love love these! What a great idea! They look so real with the flower pattern on them! Thanks for sharing! I'm so glad I found your blog! I just made these and they're delicious! However, the dough is the consistency of ooblek and this is a PAIN to roll out. It was a lot of work but they taste and look great. I gave you a SHOUT OUT on my blog today! My google follower is down...but as soon as it is functional again, I will be following! You have a delightful blog! Has ANYONE been able to do this? I've tried twice, following the recipe to a T, and failed. I also failed miserably! I know I am no Betty Crocker but I can follow a recipe. These are beautiful! I'm not fond of anything that tastes even vaguely of coconut, but I just adore the photographs and had to comment. Also, I wanted to ask you a question. I'm new to your blog and I'm confused about how you differentiate between tablespoons and teaspoons. Is a capital T a tablespoon and a lower case t a teaspoon? It's a bit confusing because I'm used to seeing (and using) Tbsp (tbsp; I can be lazy and not capitalize) for tablespoon and tsp for teaspoon! I want to "test drive" about four of your recipes for my dad's birthday party before his party and it's really confusing me! P.S. I'm sorry if the whole T/t is a dumb question. I'm a high functioning autistic and need things cleared up quite a bit. If I ever seem to pry, seem too bossy/condescending/snarky/etc., please tell me. I'm quite normal in every area except conversing with people-online and in person (although I fare better online than in person.) I thought I would tell you ahead of time as I think I'll be here a LOT. I love to cook and bake! Huh I really don't know how you achieve this but here it doesn't work at all. Yeah it tastes really good but forget any kind of roll up cookies thing. Impossible! I fried the tapioca the first time, doesnt' work. I microwave the second, doesn't work. I froze the mix, it was not so bad but sticky again... I really don't understand! Alicia, Alia, Jenn: Thanks! Glad you like them. Erin: Yes, I do agree that they're a pain to roll out. Because the dough has to be so thin, they do end up difficult to transfer to the baking sheet. Nonetheless, I'm glad to hear that they worked out! Lynne: Thanks for the shout out :)! chowbellaroma: Thanks! Btw, you have a cute blog name. Katie: Actually, this seems to be quite a common question. The big "T" is tablespoon (the larger measurement), while the little "t" is teaspoon (the smaller measurement). I've actually been meaning to go back and change that, but I haven't gotten around to it yet. Happy baking! Anonymous 1 & Anonymous 2: I'm sorry to hear that the recipe didn't work out. I really do try my hardest to make my recipes as detailed as possible because I know that most of them are rather finicky and complicated. Plus, there are so many outside factors that are difficult to account for. A different brand of coconut milk could make all the difference. Or maybe the weather in your region of the world is much more humid, which would mean that the tapioca flour needs much more time drying. It's really frustrating for me to read your comments because you know what? I do want you to succeed. If that weren't true, I wouldn't be here sharing my recipes with all of you; I'd just post my pictures and be done with it. It's times like this that I wish that I could be there while you bake to see what you're doing, but I can't. The only way I can help you is if you ask me questions or give me the full story on what went wrong. But you aren't doing that. You aren't even leaving me an e-mail address to contact. Instead, you're here complaining, rudely accusing my recipe of not working, which basically implies that you blame me for your failure. So know that I'm totally willing to help, that I want to help. But if you're just here to complain, I'd rather you not. Thank you so much for clearing that up for me! That's what I thought originally, but I wanted to make sure. This might be an irrelevant question but... do you check your email often? Anonymous: Usually, I try to check it a few times a week, but I've been quite busy for the past few months, so I do check it at least once a week, but if it's not super urgent, I've been taking a while to reply. Sorry about that if you've e-mailed me and haven't gotten a response yet; if it's been a while and I haven't replied, it's possible I accidentally skipped over it, so please e-mail me again. Can I use corn starch instead of tapioca starch? love this! i love your whole blog. you're so talented and creative! gluten free desserts: Glad to do so :). Anonymous: Nope, stick with tapioca starch. Corn starch has a slightly different texture and density from tapioca starch, which would affect the final taste and texture of your product. Anonymous: Thank you. That's so sweet of you to say. Shelly: I don't mind at all. Thanks for the mention! Hi! I was beyond giddy to find this recipe! My daughter's birthday is coming up & will be a luau AND she has major gluten sensitivity... so this is perfect! But.... :( I followed the ingredients & steps & the dough never got dough-y, even after 20 minutes of mixing. so I kept adding tablespoons at a time of the coconut milk until I had the right consistency. I rolled out the dough, transferred to the parchment lined cookie sheet, made all the straw holes & placed it in the oven. Within 3 minutes I had bubbly thin sheet of dough... like it all just oozed together. Help pretty please? O Mama Mia: I think all the extra coconut milk is what caused it all to ooze together because the dough was too wet. I'm guessing that the tapioca flour wasn't dry enough. Maybe try microwaving it on high 1 minute, stir it, then microwave it another minute (I used a fairly large plate to microwave my flour so perhaps the extra surface area helped distribute the heat better). Then make sure the flour is totally cooled before using it. After adding the coconut milk, if the dough is still too dry, add more coconut milk 1 tsp at a time, mixing after each addition. You shouldn't need to be mixing the dough 20 minutes. And the dough shouldn't be wet at all, I found the dough to be almost dry yet still pliable. Sorry that this recipe is so finicky. I hope this helps. If you have any more problems, shoot me an e-mail (unmacaronrose [at] gmail [dot] com). Wow, they look real. Beautiful. 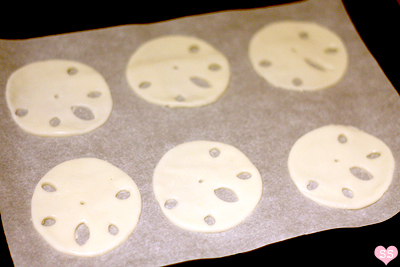 For anyone who may be tearing out their hair trying to transfer the cookies to the baking pan: we found that cutting out the circle and removing the excess (rather than removing the circle from the rolled dough), turning the plastic wrap upside down, putting the circle on the parchment paper, then pealing the wrap away was MUCH easier! These are fantastic! I am going to blog them in a few days.... doing a blog on yumminess.... thanks! 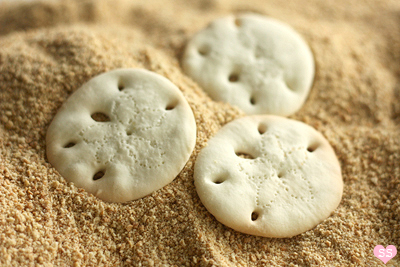 My Mimere loved to find sand dollars at the beach. We have come to associate them and treasure all types since she passed away. I wear her cross with a 'sand dollar' charm that I found in a small gift shop in Maine a couple of years ago. I will make these to share on her birthday this year - she would have been 98 years young. Hey there! I love these cookies! Im trying to make them, but cant find the Tapioca Flour anywhere! Any alternatives I could use? I've also provided a link to your tutorial and blog, and will be promoting this article and your blog during the month of June. 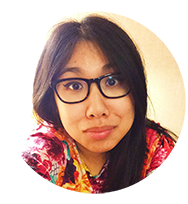 Thanks so much for sharing your ideas with the world via your blog. Keep up the amazing work! perfect with a glass of blue champagne!! I loved the idea, but while making discovered it is indeed hard to roll the dough out, so in desperation just placed the semi rolled dough right on the baking sheet, then had an idea - after it baked for maybe 4 min, I took them out, cut circles and holes out, removed the excess dough (some triangles were used to make sail boats on "ocean" cupcakes), and placed them back in the oven for the remainder of the baking time - much easier! And cookies were saved! Thank you for sharing the recipe! Super cute. Every year us Californians approach summer with excitement and every year we "cant believe how gray/rainy June is" I always expect more from you, June....guess that's where June gloom comes from. how many does the recipie make????? Can you bake these and freeze for later? Does the butter have to be "butter"? I wanted to let you know I found these through Pinterest. I had a really difficult time cutting these out with the cookie cutter. However, I ended up just pinching off dough and rolling/patting it out like pizza dough or silly putty. My nearly-4 yr old and I poked away with straws and toothpicks, and they turned out wonderfully! I added them around her mermaid birthday cake, since sand dollars are supposed to be mermaid currency, as you noted. Thank you so much for posting this fantastic idea! Just finished these! They came it perfect! Had to use a little extra coconut milk and get the roommate's strong arms to mix the dough to its full extent. I'd say it's more like feta than mozzarella before you roll it. thank you for this awesome recipe! I'm sure it will be a huge hit at the bridal shower! I live in New Zealand and my parents are from Malaysia so I really enjoyed rading about the inspiration for these lovely beachy cookies. Just made a batch, turned out really nicely. Although i didnt have time to go to a specialty asian food store so used cornflour instead of tapioca. Was also too lazy to roll out the dough so just used a teaspoon to portion out little balls, then rolled in the palms. The balls flattened out while baking so still looked similar to yours. Hi Susan! Just made your cookies and they turned out perfect! I am so excited! My daughters and I are giving their sister a Beach Themed Bridal Shower. They are such a delicate cookie with a hint of sweetness. I would only add that I cut them out on the plastic wrap and than gently removed them and put on the cookie sheet with parchment paper. These were time consuming but well worth the effort for a special occasion. Thank you so much for the recipe!!! How many days do these stay fresh? I want to bake in advance for a party. Thanks. Where can one find pearl milk tea straws in a hurry?